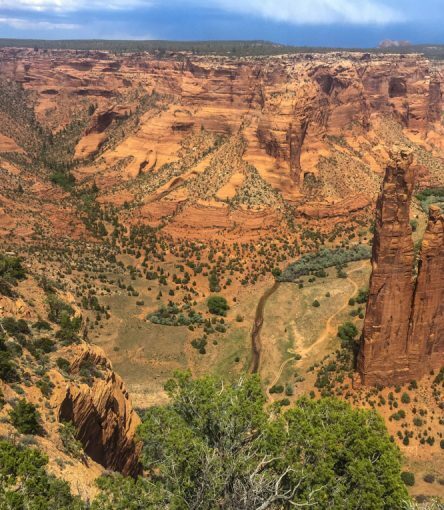 Join our guided hiking trip in Canyon de Chelly for 4 days of camping and exploration in the remote landscape of the Navajo Nation. On this adventure, our expert guides are joined by a Navajo guide that can lead us far beyond the reaches of the general public. By staying within the canyon surrounded by monumental sandstone cliffs and ancient ruins we will gain a rare and unique perspective of this sacred Navajo land. 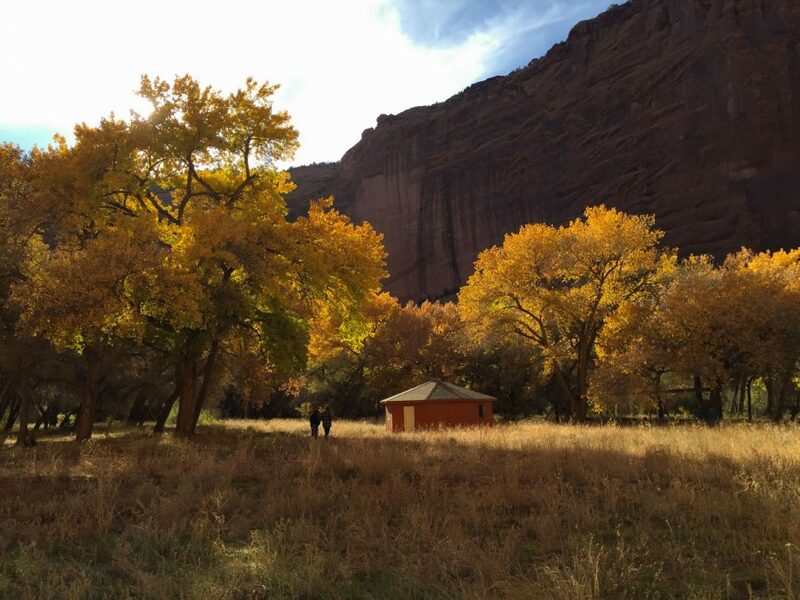 Perfect for groups of friends, active families, and single travelers, this guided adventure of Canyon de Chelly provides comfortable camping, access to areas not open to the public, high adventure, and all the difficult logistics! With food, available rental gear, and the complex details taken care of you can relax and enjoy your vacation. 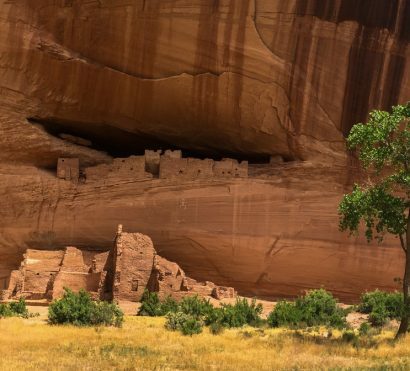 A trip to Canyon de Chelly is the closest thing to a trip back in time you can find in the American Southwest. On this tour we explore a land that has been inhabited continuously for nearly 5,000 years by a handful of different native groups. We set up our comfortable base camp surrounded by towering sandstone cliffs and so close to archaeological sites that it’s hard to fathom being allowed. We’ll spend our time in the company of a local Navajo guide that can share their knowledge and culture with us. 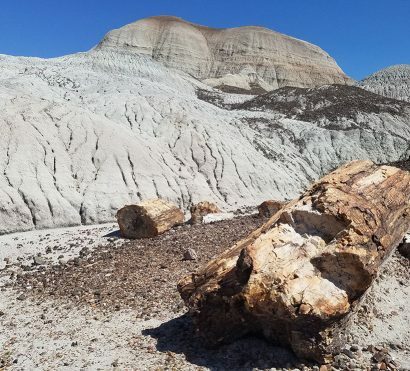 As a bonus on this tour we visit Petrified Forest National Park where we explore a preserved slice of the Triassic Period full of larger than life fossilized remains paired with an archaeological record that goes back millennia. 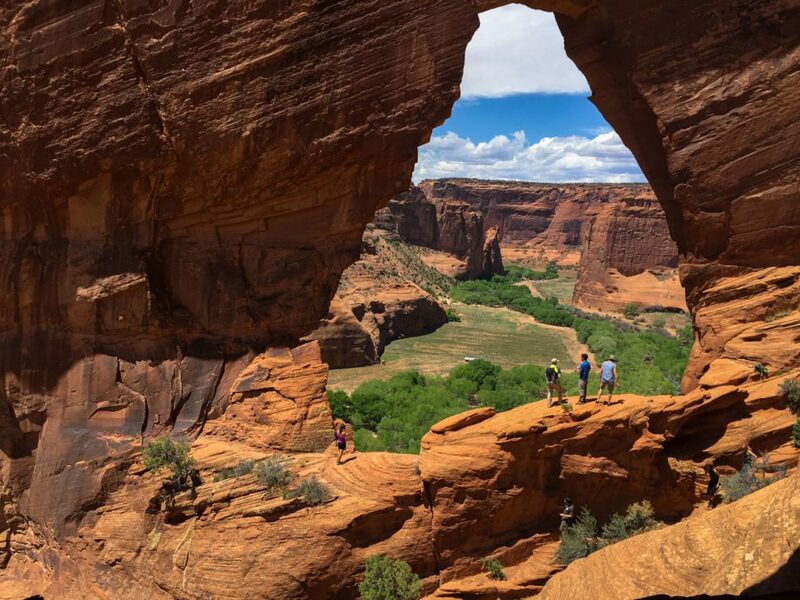 Few trips can compare to the combination of hiking and history that the Canyon de Chelly Hiking and Camping trip offers. Trip Start: Meets in Scottsdale, AZ at 9am on day 1. Trip End: Drops off in Scottsdale, AZ between 5 – 7pm on day 4. 9:00 am – Meet your guide at the Holiday Inn Express in Old Town Scottsdale. 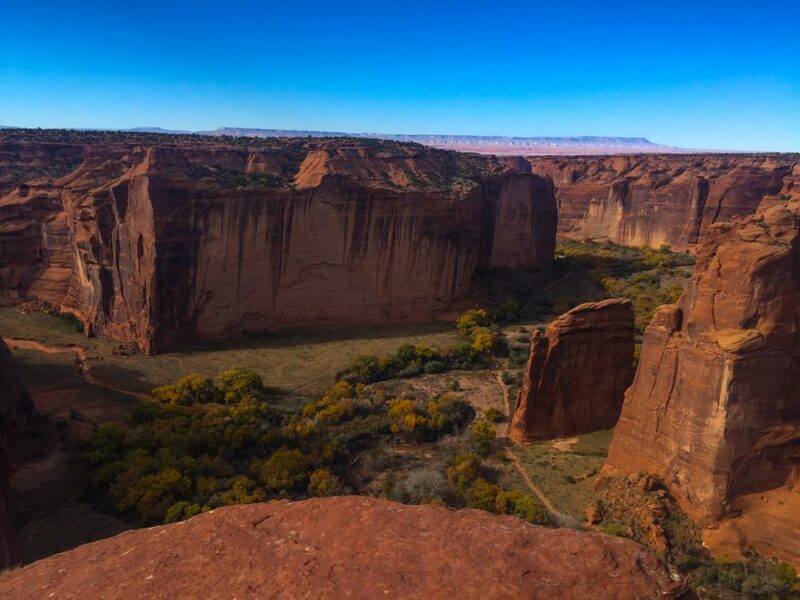 After a brief orientation we depart for Canyon de Chelly with a few interesting stops along the way. After a brief lunch stop in historic Payson Arizona we’ll descend out of Tonto National forest and into the Painted Desert. Once in the picturesque Painted Desert we take a worthwhile detour to Petrified Forest National Park.13,000 years of human history and an incredibly preserved fossil record of the Triassic Period make the Petrified Forest a playground for the curious and we’ll take a few hours to explore it’s secrets. Tonight we’ll stay inside the National Monument at the Thunderbird Lodge where we find ourselves poised for an efficient start to our journey into Canyon de Chelly. We’ll think of the Thunderbird Lodge as a gateway into this sacred land for the Navajo people and soak up as much of the history and culture as we can. After a hearty breakfast at the Thunderbird Lodge we acquire our permits and meet our local Navajo guide. Our gear will be transported for us into the canyon so today we hike with only our daypacks. We start our hike at an incredible overlook at the top of sheer sandstone cliffs. After about 3 miles on a narrow descent we will have lost nearly 1,000 feet of elevation before settling into the canyon floor. Your guides and the incredible sights will continue to awe you as we wind our way through the canyon on our way to our basecamp home for the next two nights. Over the last 5,000 years this sacred land has been home to the Archaic people, the Basketmakers, the Ancestral Puebloans, the Hopi, and now the Navajo people. Today we take the opportunity to explore the remnants of these ancient civilizations along side our local guide who can share the stories and history that has been handed down over millenia. The intricacies and ingenuity of the ancient pueblos and prehistoric rock carving are truly a wonder to behold and tonight we return to our camp full of new insights and tales of great cultures. On our final morning together we soak up our last breathtaking sunrise before starting our ascent out of the canyon. After a delicious guide prepared breakfast and coffee we begin our hike. Our hike takes us about 5 miles and up 800 vertical feet before arriving at our conveniently shuttled van. On our return to Scottsdale we take a lunch break in historic Winslow off old Route 66 before returning to the Sonoran Desert and into Scottsdale. AOA’s adventures might challenge you, but we don’t want them to surprise you, these Nitty Gritty details can help you decide if this is the right trip for you. Cell Service: Cell service is quite limited in Canyon de Chelly. 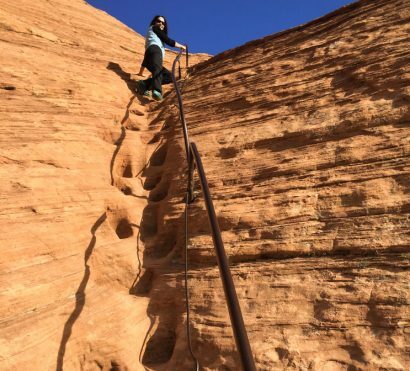 You should expect to be unreachable during the Canyon de Chelly part of this trip. Bathrooms: Our basecamp has a primitive but functional bathroom. It’s possible while hiking that “nature calls” while on the trail. In this case you may need to use a Wag Bag to pack out any waste and ensure we Leave No Trace. On night 1 of this trip we stay at the historic and unique Thunderbird Lodge. It is comfortable and interesting, but the lodge and restaurant are a bit dated. The first and last days of this trip require long drives from Scottsdale, however there are many interesting stops along the way. Expected to be in the van for about 4-5 hours. When working with our Navajo guides and hosts we don’t have control of all of the complicated logistics that make this unique trip possible. 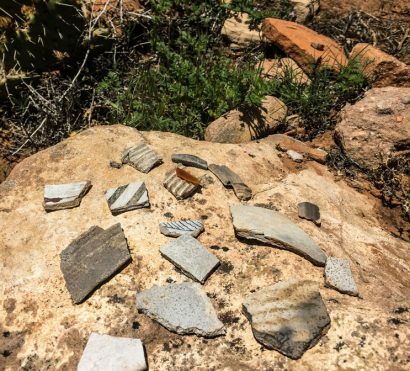 This can cause minor delays and variances from our published itinerary, but it should be viewed as an integral part gaining exclusive access to special parts of the canyon and also part of an authentic cultural experience. 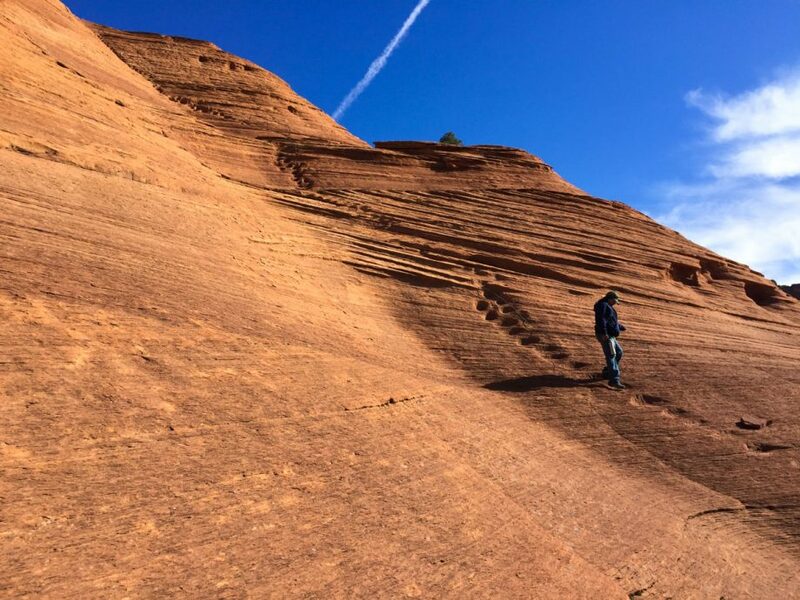 While hiking in Canyon de Chelly, we will encounter some trails where those who have a strong fear of heights may be uncomfortable. Once on the valley floor we have a long but beautiful hike through sandy terrain. The sand can make the hike feel more difficult than comparable miles on firm ground.